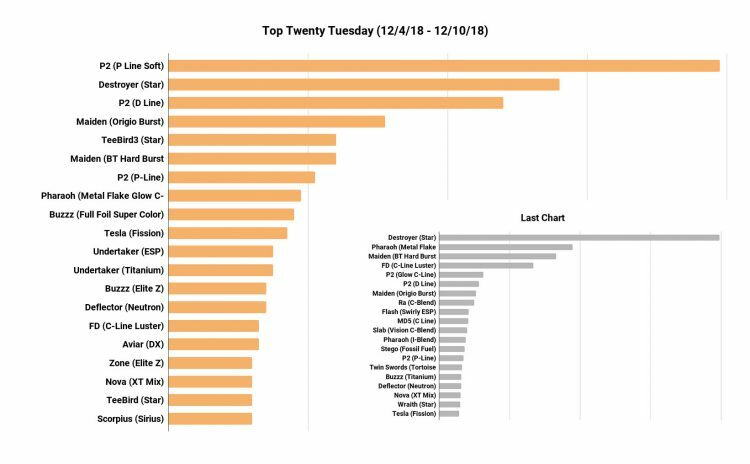 Infinite Discs is happy to present the weekly blog post called TOP TWENTY TUESDAY where we let you know about the short-term sales trends for discs. We’ll show the sales figures from the previous Tuesday through the most recent Monday. New discs will often spike in the chart as other top sellers shuffle spots. 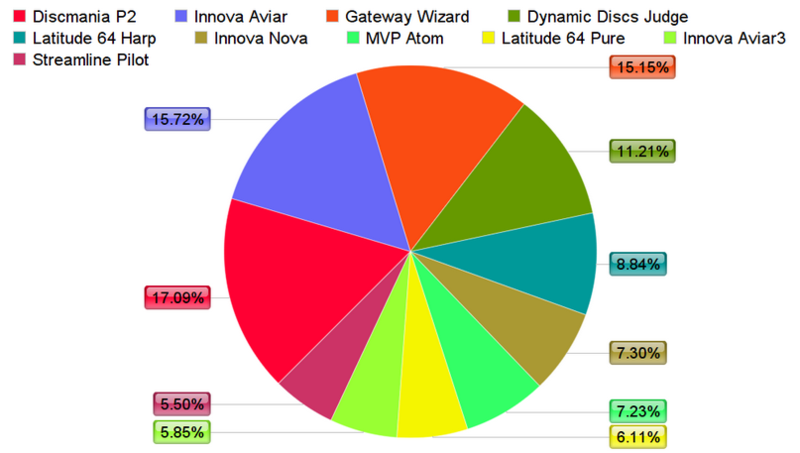 It can be fun to see which discs keep up the pace. These will also be broken down by plastic types, so the same model can show up in multiple plastics. This week, we see the Star Destroyer jump back to the top position, where it tends to hang out quite regularly. The new Bullfrog flat-topped, low-glide putt-and-approach disc jumped to the 2nd spot, and the 3rd position was taken by the Sirius SCORPIUS by Millennium since we saw the release of the Gregg Barsby signature edition. 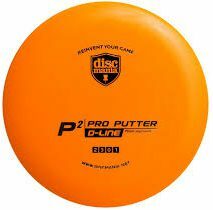 Some of the other spots are filled by discs which seem to be making a regular home on the top 20 chart, like the different P2 putters, different Buzzz discs in different plastics, etc. The ESP Force jumped into the 19th spot as it has also received a boost from McBeth hype. WINNER – The guessing contest for this week’s chart was for the #10 position. We had several people guess on the Elite Z Buzzz, which is a very good guess. But nobody picked the Swirly ESP Buzzz, which jumped onto the chart because of the new swirly Ledgestone 2019 editions that game in, robbing the Elite Z plastic of attention this week. Sorry…no winners this week. GIFT CARD PREDICTION FOR TWO WEEKS: Leave your comment below this blog to predict the #3 spot for two weeks from now, since we’ll skip the Tuesday Top 20 next week for Christmas. Leave your guess for #3 in the comments, and thanks for supporting the Tuesday Top 20! The Star Destroyer dropped to 2nd place for the first time in a while with the P-Line Soft P2 taking its place at #1. 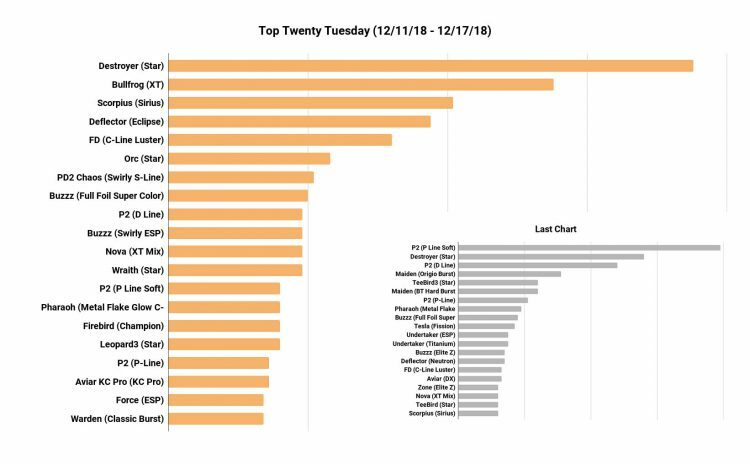 The P2 holds three spots in this week’s chart, and that seems pretty typical as the P2 putter by Discmania has been the hottest selling putter all year at Infinite Discs. The Maiden by Westside is holding strong with the #4 and #6 spots this week– an exceptionally straight-flying, flat-topped, low profile putter. The Metal Flake Glow C-Blend Pharaoh is still selling strong since its release before Thanksgiving. 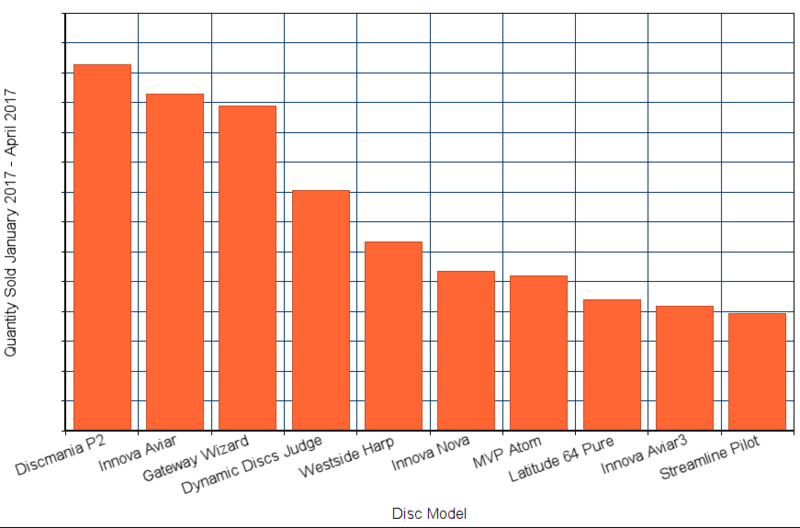 One of the biggest movers in the charts this last week has been DISCRAFT in general, with the BUZZZ taking two spots (Full Foil Super Color sparked again with the Star Wars releases) and the Undertaker driver taking two spots, and the Zone taking a spot. That is 5 spots for Discraft week! Also, the Sirius Scorpius by Millennium entered the chart on word that a Gregg Barsby signature edition is coming. WINNER? – The guessing contest for this week’s chart was for the #5 position, and it looks like we didn’t get a winner. There were some excellent guesses for discs that ended up all over the chart, but the closest to the #5 Teebird3 was somebody guessing the Star Teebird (very close, but not quite). GIFT CARD PREDICTION FOR NEXT WEEK: Leave your comment below this blog to predict the #10 spot for next week’s “Top Twenty Tuesday” chart. Have fun and good luck! 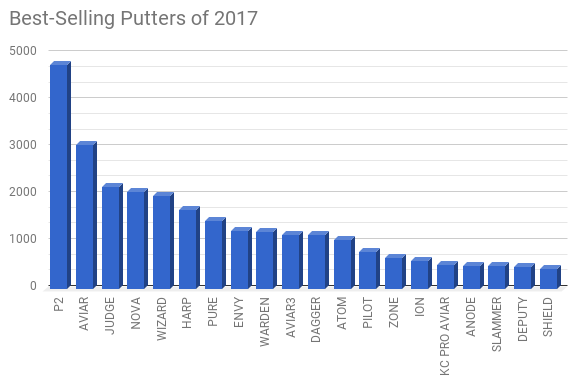 We’ve been tracking putters sales all through the year 2017, curious to see which would rise to the top by the end of the year. 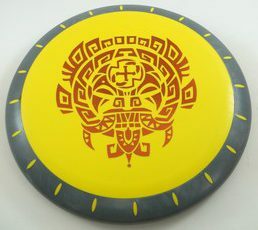 The early lead by the Discmania P2 simply gained momentum as the year went on. The results are in, and these are the top 20 best-selling putt-and-approach discs at INFINITE DISCS. That list of top-20 features a lot of great putters. But perhaps the most interesting statistic about that list is the huge disparity between #1 and #20 in terms of numbers sold. The #20 Shield putter sold less than one tenth the number of the #1 P2 putter! The P2 also sold more than the #3 Judge and #4 Nova combined! WHICH P2 PLASTIC SOLD THE MOST? When it comes to putters, softer plastic blends still rule. They are usually preferred for actual putting, while the more durable plastics are preferred for approaches and drives. 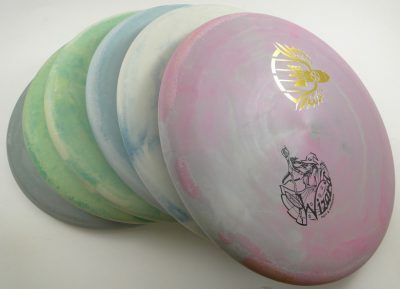 Why Not More Mid-Range Discs? When it comes to mid-range discs, they are generally the overlooked and forgotten discs in a player’s bag. For a lot of amateur players, there is much obsessing over which putters will suddenly make all of those near misses fall in the basket, or which drivers will suddenly give them an extra fifty feet of driving range. But less often do those players think about which disc will navigate them through the twists and turns of shorter shots on tricky fairways, or fly moderate distances with great accuracy toward the basket. Mid-range discs really should be the meat and potatoes of most player’s games. Even pro’s often turn to mid-range discs for control shots and drives that they need to see land with precision. 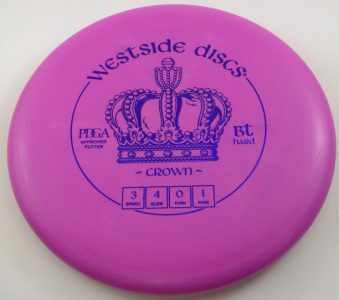 Yet for many players, it’s just hard to get excited about mid-range discs. 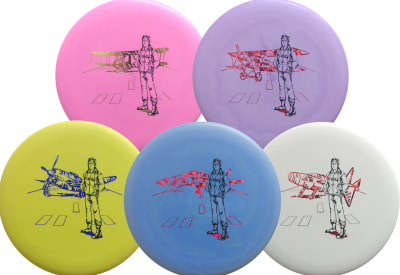 We can see in the sales statistics for 2016 at Infinite Discs, that certain mid-range models have won the hearts of the masses, like the Buzzz and the Roc3. But once you pass those top few best-sellers, the sales totals drop precipitously for other quality mid-range discs. 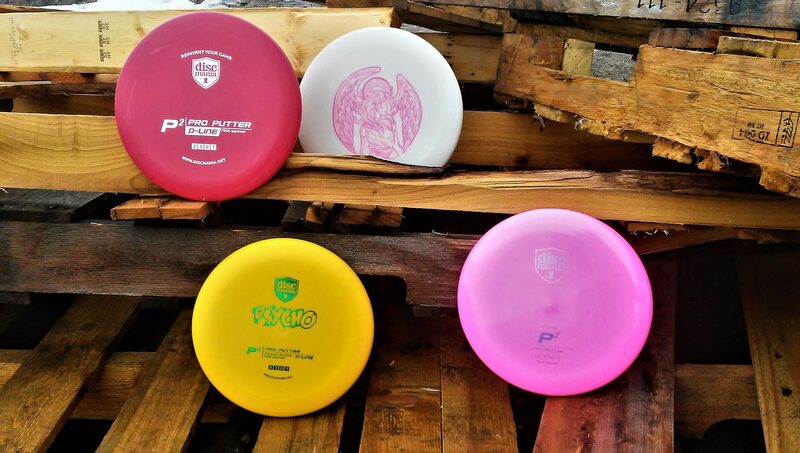 It seems that many players purchase one or two of the most popular mid-range discs, and then consider that spot filled and move on to filling a bag with more drivers.